Ford India launched the smart,safe and sophisticated Figo Aspire. It is the first 'Made in India' sedan from Ford. 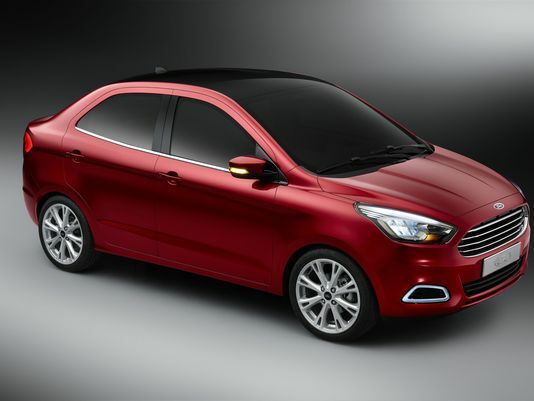 Built at Ford's car manufacturing plant in Gujarat, the new Ford Figo Aspire is priced Rs 4,89,990 onwards. The Figo Aspire boasts comfortable leather seats with adjustable headrests. It has a long wheel base that offers good legroom in the front for passengers with ample room at the rear too. The vehicle offers 20 smart storage spaces and convenience features. The vehicle has a bold trapezoidal grille and elongated headlamps. It has chrome highlights and fine details in the headlight design. Advanced connectivity solutions, including segment-first MyFord Dock and SYNC with AppLink. Available in 4 trim levels - Ambiente, Trend, Titanium and Titanium+, Ford Figo Aspire offers 1.2-liter Ti-VCT petrol engine, delivering a peak power of 88 PS and fuel economy of 18.2 Km/L and a 1.5-liter TDCi diesel engine, offering a peak power of 100 PS and an outstanding fuel economy of 25.8 Km/L. Both these engines are paired to a responsive five-speed manual transmission. Figo Aspire will come with a 6-speed PowerShift automatic transmission paired with a 1.5L TiVCT petrol engine, offering a peak power of 112 PS and a fuel economy of 17.2 Km/L. The Figo Aspire features a robust passenger cage made of high-strength steel and dual front airbags. It comes equipped with up to six airbags – including side and curtain airbags. If the vehicle experiences a serious collision, Emergency Assistance uses SYNC and a Bluetooth-paired phone to automatically call emergency contacts and provide information about your vehicle and location. "The year 2015 is the year pf next stage of growth for Ford India.We plan to launch three new products in next six months starting with the Figo Aspire today. "Ford India President and Managing director Nigel Harris told reporters here. He said that Figo Aspire has been developed keeping the requirements of indian customers in mind such as good Design,high fuel efficiency and value for money,while meeting Ford's global standards. On paper,the Ford Figo Aspire looks mighty impressive and measures up quite well against its competitors.It has also been decently packaged with features and equipments across all varients. The Ford Figo Aspire certainly has the potential to be a massive hit among customers in India. The Figo Aspire is available in 7 colors-Ruby red,Sparkling gold,Oxford White,Tuxedo Black,Deep Impact Blue,Ingot Silver and smoke Grey respectively.